When you a stay at Hotel IPV Palace & Spa in Fuengirola, you'll be on the beach, within a 5-minute walk of El Castillo Beach and Sohail Castle. Featured amenities include complimentary newspapers in the lobby, dry cleaning/laundry services, and a 24-hour front desk. 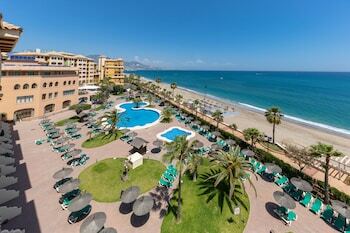 Planning an event in Fuengirola? This hotel has 15263 square feet (1418 square meters) of space consisting of conference space and meeting rooms. A roundtrip airport shuttle is provided for a surcharge (available 24 hours), and self parking (subject to charges) is available onsite. When you stay at this apartment in Graus, you'll be within the vicinity of Puente Románico. Free self parking is available onsite. With a stay at Avenida Suite La Concha - Iberorent Apartments, you'll be centrally located in San Sebastian, steps from Concha Beach and 11 minutes by foot from Monte Urgull. When you a stay at Villa El Veril in Playa del Ingles, you'll be on the beach, within a 5-minute walk of Paseo Costa Canaria and Las Burras Beach. Free self parking is available onsite.